All paddlers are required to wear a life vest when on the water — no exceptions—and will need to follow the directions of our Instructor and staff. Paddlers must be able to hear and understand instructions and communicate with the program instructor and staff, enter, exit and sit in a kayak without assistance, hold and move a kayak paddle, hold their breath under water and keep their head above water while wearing a life vest. Our programs take place rain or shine, but strong winds or lightning will cause cancellation. We reserve the right to cancel or limit classes or trips due to weather or water conditions. Events may be cancelled for water quality caution if it has rained 1 inch or more in the previous 24 hours. Full refunds are made if BKG cancels a program for any reason. • Quick-dry shorts & shirts or a swim suit. Cotton tends to be chilly if it gets wet. A windbreaker is helpful on a breezy day. • A hat—secured with a clip or strap. It can get windy on the water. • If you wear glasses, we recommend clips or “croakie” style straps. If you wear contacts, consider whether you are comfortable wearing them if they get wet. • Phones and handheld devices: If you have a waterproof pouch for your phone or device, great. If not, we recommend that you leave it in our secure container before heading out on the water. • We recommend bringing a dry set of clothes to change into after your class or paddle session (Lockers & changing room nearby at Pier 2). We reserve the right to cancel or limit classes or trips due to weather or water conditions. Events may be cancelled for water quality caution if it has rained 1 inch or more in the previous 24 hours. Programs may be cancelled if a minimum number of participants (typically 2 or more) are not registered at least 48 hours in advance. BKG will make a full refund if it cancels a program for any reason. If you cancel a reservation more than a week before a class, trip or session, BKG will refund 100% of the fee. If you cancel less than a week but more than 24 hours in advance of a class, trip or session, BKG will refund 50% of the fee. There is no refund if you cancel a reservation within 24 hours of a class, trip or session. Private or special classes, trips may have different cancellation provisions. The Kayak Foundation is a leader in youth kayak programming & instruction. We partner with The Brooklyn Bridge Park Conservancy to provide a range of youth kayak opportunities for camps, youth groups and summer programs. For information on the Brooklyn Bridge Park Kids Kayak Program for camps, youth groups and summer programs, please contact the Brooklyn Bridge Park Conservancy. The Kayak Foundation does not operate its own youth camp – all camp activities are coordinated through the Conservancy. The Kayak Foundation has gathered an outstanding collection of some of New York’s finest paddlers and teachers. Our guides understand that their first job is to offer clients a safe and supportive atmosphere to explore our wonderful waters and to improve individual skills. All of our staff have years of experience and a welcoming attitude; many have formal American Canoe Association instructor credentials. 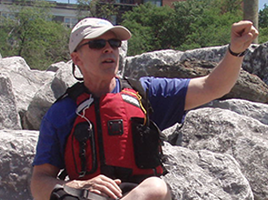 Tom Potter fell in love with kayaking in 1989 and has been paddling ever since. He founded Brooklyn Kayak Guides to support and grow the kayaking community in and around Brooklyn. Tom is co-founder and former Chairman of the Brooklyn Bridge Park Boathouse, a completely volunteer-run organization dedicated to promoting human-powered boating in Brooklyn Bridge Park. Tom was the senior kayak instructor at the Sebago Canoe Club (New York’s largest ACA-affiliated paddling club) from 1999 to 2007. He also served for many years as Sebago’s Sea Kayak Chair and on its Board of Directors. He has helped hundreds of students achieve their paddling goals: having fun, keeping safe, learning skills, and winning American Canoe Association and British Canoe Union certification. He is an ACA-certified Level 4 Coastal Kayaking instructor, and is the longest-tenured instructor at this level in New York. In addition to sea kayaking, Tom is also an active kayak polo player and whitewater paddler. His favorite whitewater rivers include the Buller and Tongoriro in New Zealand; the Middle Fork Salmon in Idaho; the Gallatin in Montana; the North Fork American in California; and the Grand Canyon of the Colorado in Arizona. Locally he can often be found paddling Labyrinth on the Dryway. As an ACA-certified Level 4 Whitewater instructor, he has taught whitewater kayaking to individuals and at Columbia University. Tom is a long-time member of New York Kayak Polo and a previous manager of its “B” team. He holds the distinction of finishing in 2nd place at three consecutive B Division national championships, which he maintains should earn him a lifetime “Mr. Congeniality” award. Tom is perhaps best known in Brooklyn as a businessman. He is the President of New York Distilling Company, one of the nation’s premier craft distilleries. He was the co-founder and, for 17 years, Chairman and Chief Executive Officer of the Brooklyn Brewery. He serves as a board member or adviser to many local companies and community groups. Beth Schermer came to kayaking from a love of river rafting and working with teenagers. A long-time Arizona resident, she is often found on the Grand Canyon of the Colorado in Arizona and other western rivers. Along with Tom Potter, she helped establish the summer Kids Kayak Program at Brooklyn Bridge Park. 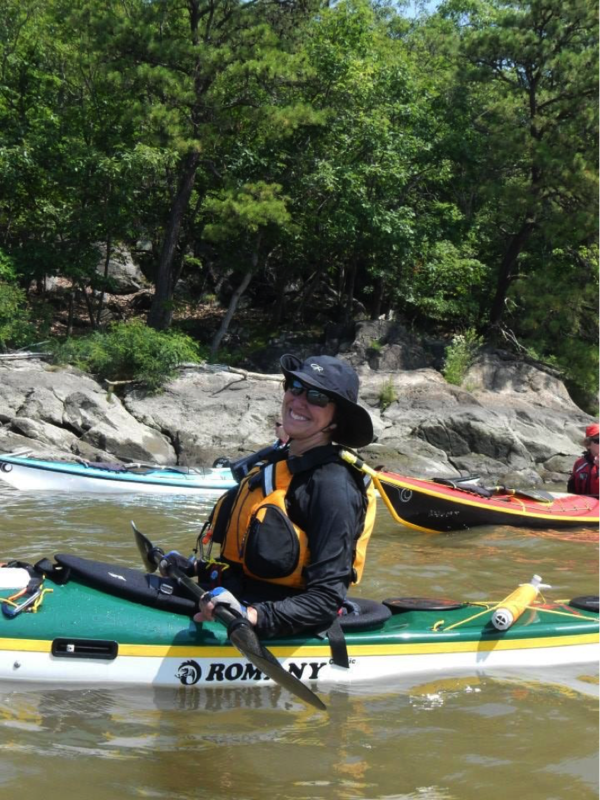 She is an ACA-certified Level 2 Coastal Kayak Instructor and Trip Leader. When she is not on the water, Beth is a principal in Christofolo Schermer Consulting, providing strategic and business planning services, leadership team development and communications skills to companies and nonprofit organizations across the country. Matt has been paddling one way or another since he was a kid. He has been sea kayaking for almost 10 years. Nothing makes him happier than seeing people of all ages get out on the water. He has paddled all around the NYC metropolitan area as well as many places across North America. He is an ACA-certified Level 3 coastal kayaking instructor and trip leader, as well as a Level 2 SUP instructor. He is also a member of Sebago Canoe Club. Matt is a fan of dinghy sailing too. Todd came to paddling in 2000 after many summers travelling via backpack through Alaska and the Northwest. 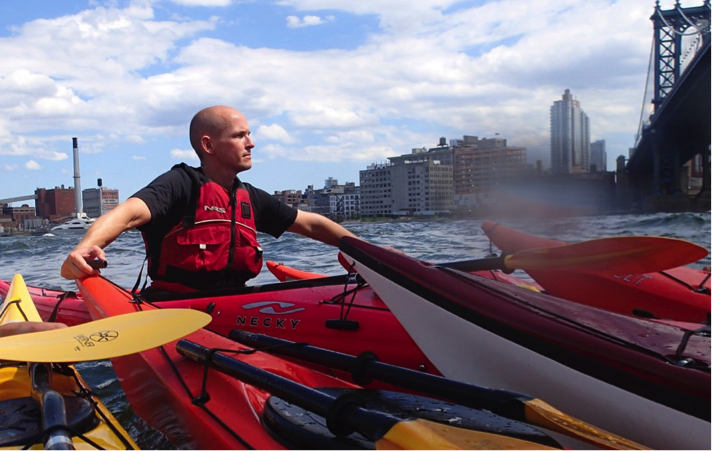 Todd loves sea kayaking in all of its forms, from rough water and extended expeditions to day paddles in NYC—and loves introducing people to the unique paddling opportunities that NYC offers. He claims to be a lazy fellow (we beg to differ) and when he realized that he could float his gear in a kayak rather than endlessly fight gravity with a backpack he was hooked. He has gotten a bit sportier since then but still strives for the efficiency of good form over needless energy expenditure. Todd is active in his local paddling community, particularly The Red Hook Boaters (www.redhookboaters.org), which provides free kayaking to the community. In the winter he is an active kayak polo player with the New York Kayak Polo Club (www.nykayakpolo.org). He is an ACA Level 4 instructor, recently completed BCU 5* training and is Solo Wilderness First Aid certified. Phil Giller has been kayaking for over 12 years. He loves to introduce people to the sport of kayaking. There is nothing like the look on people’s faces when they realize that they have gone from point A to point B and back to point A all under their own power; not to mention enjoying the natural wonders right in their own backyard. Phil has organized and run free public kayaking programs at Sebago Canoe Club and Yonkers Paddling and Rowing Club, putting thousands of first timers on the water over the past 10 years. Phil is also one of the people who heads the New York City Water Trail Association. Phil is an ACA Level 2 Coastal Kayaking instructor. 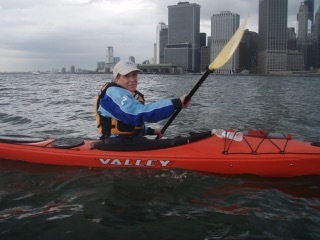 Mike Sylves is an ACA 2 Sea Kayak Instructor as well as a Brooklyn Bridge Park Boathouse volunteer and board member, program leader, and safety boater. He is also an enthusiastic Kayak Polo player. Mike was born and raised in Buffalo, and first kayaked on lakes in the Adirondacks. Mike enjoys kayak trips, hiking, camping and general exploring, and his favorite NYC harbor trip is the Liberty Island loop. Last fall Mike went on his first whitewater run and loved it! He’s hoping to get back in the rapids soon. Noah is an ACA-certified Level 3 Kayak Instructor and Day Trip Leader, as well as an ACA-certified SUP instructor. 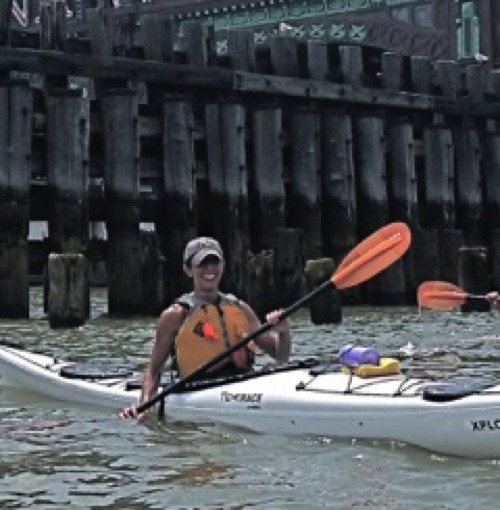 He is a former chair of Brooklyn Bridge Park Boathouse, a nonprofit kayaking organization which brings kayaking joy to both New Yorkers and visitors for free, and an active ACA volunteer. Ilene is a passionate kayaker who loves to see the city from a different perspective, just above the water line, from the seat of a kayak. She has paddled extensively around the New York area and on longer trips in Maine and Baja California. You can also catch her playing kayak polo and teaching paddling skills through the Sebago Canoe Club and Brooklyn Kayak Guides. Terry Ellison is an ACA-certified Level 2 Kayaking Instructor, as well as a Brooklyn Bridge Park Boathouse volunteer and Assistant Trip Leader. He loves getting people out on the water for the beauty, thrills and community of kayaking. A native Brooklynite, Terry spent summers rowing Hudson Valley lakes and rivers in inflatable canoes, jon boats and college crew racing shells. Kayaking in NYC since 2007, Terry is excited to share the paddling lessons he's learned and raise awareness of the incredible outdoor opportunities here in our backyard. As a Michigan native, Stefanie grew up loving the water and all it had to offer, including white water rafting, wakeboarding and water skiing. Stefanie moved to NY in late 2012 and became an avid kayaker and SUP paddler. Stefanie is a BCU Star Level 1, ACA Level 2 Kayaker instructor, and an ACA-certified Level 2 SUP instructor. Chris has been sea kayaking for nine years. She has paddled all around the NYC metropolitan area and in the North East. She is an ACA certified trip leader and ACA Level 3 coastal kayak instructor and teaches at Sebago Canoe Club and Brooklyn Kayak Guides. All paddlers must sign a waiver before they can go out in a kayak or on an stand-up paddleboard.